With the rapid development of neuroimaging and neuroscience in the past several years, the body of research and clinical knowledge about concussion processes in adults continues to rapidly increase. Nevertheless, many questions involving the functioning of a human brain post-head injury and its recover remain unanswered. There is even less known about neurodynamics of concussive processes and recovery in children, whose young brain remains in a state of constant developmental change. There is enormous amount of variations, which are introduced in to the picture of pediatric concussion, that have to do with the child’s brain developmental phase at the time of the injury, its capacity for plasticity and adaptation to TBI, and other factors. 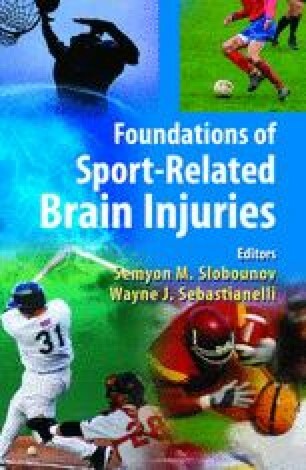 This chapter attempts to provide an overview of research and clinical data relevant to the complex interplay of a child’s developing brain and the effects of a mild head injury. There is a growing body of research suggesting that even mild head injuries produce significant neurocognitive and neurobehavioral deficits in children and adolescents. As elucidated below, there is some uncertainty and controversy in regards to the definition, sequelae of, and recovery from pediatric concussions. The review of literature supports the idea that concussive processes produce a unique profile of neurocognitive and neurobehavioral deficits that is different for each child, given his developmental phase at the onset of injury and pre- and post-injury characteristics. The role of a comprehensive neuropsychological examination in detection of these deficits is substantial, as it delineates child’s unique profile of strengths and weaknesses that are essential for effective treatment planning and adequate academic placement.